Home / Featured / Who will dare visit Old Market Scare? Who will dare visit Old Market Scare? Old Market Square and its tram stop are to be re-named for Halloween to ‘Old Market Scare’ to coincide with the annual Halloween event. Now in its second year, the Halloween themed attraction will be open from Friday 26 October and Wednesday 31 October. The Halloween-themed fun begins officially on 26 October (Friday). Old Market Scare will feature the UK’s biggest mobile ghost train, a walk-through Haunted House, and the ‘Scare’ Maxx ride – Reaching speeds of 90 Km/h, the bottom of the swing sends riders over 360 degrees and is guaranteed to disorientate and add even more thrills to the visit. For the younger Halloween-goers, there is an electric chair swing and a ghostly children’s rollercoaster. Those happier with their feet on the ground can enjoy the food stalls and a themed bar, all centred around a huge lit-up Halloween pumpkin. Visitors are encouraged to wear their spookiest costumes to take a selfie with the giant pumpkin which is 2-metres wide. On Halloween night itself, live entertainment and costumed characters will also take to the streets from 5:30pm adding to the spooky celebrations. 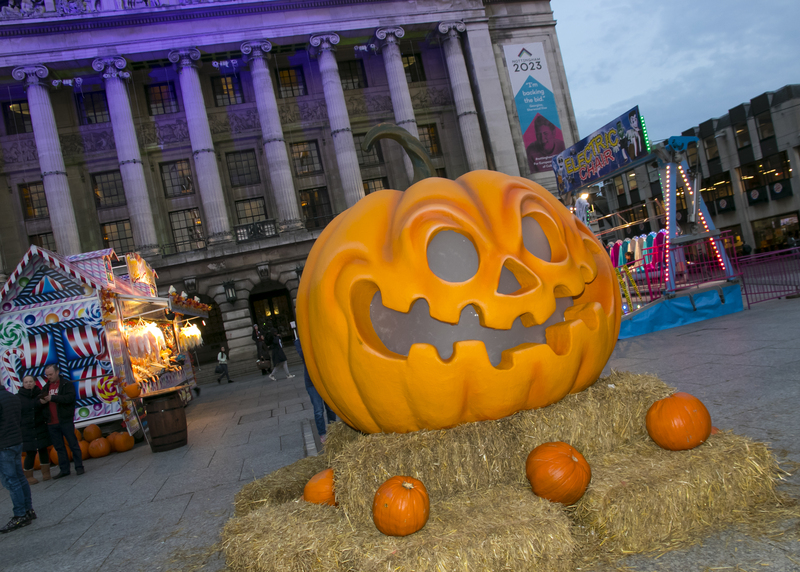 The Old Market Scare event is brought to the city by Mellors Group, organisers of the Nottingham Beach and the Winter Wonderland and Nottingham City Council. Entry to the Old Market Scare is free, but charges apply for rides and activities. While all this fun takes place in Old Market Square, there is plenty of fun to be found elsewhere in the city. Those wanting a more energetic Halloween should bring the kids to either Nottingham Tennis Centre or the National Ice Centre on 26 October. Nottingham Tennis Centre’s Monster Smash event (5-7pm) for 3-16 year olds is offering Franken-tastic tennis, terrifying table tennis as well as phantom fun on the giant inflatable tennis/darts. There will be prizes for those who come dressed in the spookiest Halloween gear! There is no need to be book – this event is completely free. A truly chilling Halloween is on the cards at the National Ice Centre’s Halloween Family Party (5:30 – 7pm) where little ghouls can skate and dance to the best Halloween family favourites through smoke and disco lights. The best costume will win a fantastic prize. Excited trick or treaters will find plenty of sweeties to go around and Sub Zero cafe will be on hand to make Pumpkin Spice Lattes for the parents. Wollaton Hall is offering Spooky Kids Ghost Tours each day until 31 October at 1pm and 3pm. These cost £5 per person. 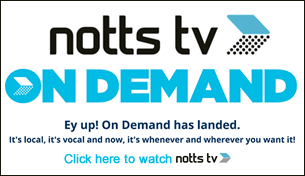 Children can enjoy spooky tales while visiting hidden parts of Wollaton Hall. On Halloween itself between 12pm – 3pm, the invitation is to join the team at the hall for a spooky, fun Halloween and come dressed to scare! Activities will include making mud monsters, and building a den fit for a troll with the park ranger. There will be Halloween games including pumpkin archery, marshmallow bobbing, pumpkin skittles and bring your scariest carved pumpkin for the competition. There are small charges for some of these events. Newstead Abbey is offering several chances to enjoy the spooky and atmospheric surroundings with Wine and Wicked Ghosts evening tours on Friday 26, Saturday 27 and Wednesday 31 October. An evening of spooky stories and terrifying tales highlighting the abbey’s haunted history is a tour not to be missed! Tours are £18 per person (includes a glass of wine or soft drink): 7.30pm – 9pm. Family Twilight Walks at the abbey on Monday 29, Tuesday 30 and Wednesday 31 October from 5pm – 6.30pm cost £7 per person. Dark and mysterious, the grounds at Newstead Abbey make for the perfect atmospheric twilight walk. Come wander the pets’ cemetery and creep through the monks’ wood – if you dare! On Wednesday 31 October between 12pm – 3pm, there will be Halloween family fun, in the house and grounds. Don’t forget to come in your Halloween finery! And watch out for the ghostly staff wandering around the house! NET Trams is offering a great deal on travelling to Old Market Scare with a £5 group ticket (up to 2 adults and 3 children). This will be available all day during the event. Stephanie Moss-Pearce, NET Marketing Manager said: “We’re delighted to be involved in this exciting event which will see our tram stop renamed ‘Old Market Scare’. By taking the tram, visitors can enjoy a hassle-free journey to the heart of the fun and they can even take advantage of our great Group Ticket offer which is running through the half-term holidays.